We talked to several players on the team to find out what keeps them at the top of their game, asking about diet, exercise and downtime. The lesson we gleaned from these conversations is that, regardless of age, finding an eating and exercise plan that works for you and having the discipline to stick with it helps to ensure overall success. Hobbies, and time with family and friends, also joined a healthy lifestyle in the players’ hat-trick of life. We hope that you can, within the next four pages, find some inspiration from your hometown, champion hockey team to fine-tune your own healthy lifestyle. For Avalanche players, food is the fuel that propels them to perform, and how their diets make them feel is crucial. Iginla: Eats hamburgers and pizza sometimes ̶ but only in moderation. Tanguay: Steers clear of fried foods and sugars and drinks a lot of fluids. During the season, it’s not hard for the players to keep up with their cardiovascular training. In the off-season, you have a good chance of finding many of the players on the golf course. O’Reilly: Golfs. “I think most of the guys will tell you that it’s a good game to help get away from hockey and focus on something else,” says O’Reilly, who also plays the guitar and the mandolin. Patrick Roy took the helm of the Avalanche as head coach in 2013. As a player, Roy helped the Avalanche and the Montreal Canadiens win two Stanley Cups each, taking home a record three Conn Smythe trophies (MVP in the Stanley Cup playoffs). While known for a bit of a fiery temper, Roy’s passion, his players say, is channeled into dedicated coaching, helping to return them to the playoffs last year. And this year? Who knows? 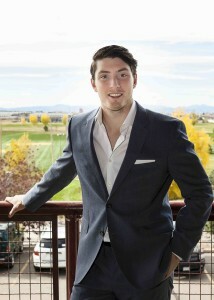 Matt Duchene played on the Canadian National Men’s Hockey Team that won the gold in Sochi during the 2014 Olympics. The team beat the Swedes, which included Duchene’s teammate ̶ Avalanche captain Gabriel Landeskog. The players can burn about 2,000 calories in a single hour-long practice. On game days, comprised of a morning practice and an evening game, players may burn upwards of 5,000 calories. An average 160-pound person can burn about 511 calories during an hour of ice skating. Although the NHL routine of being bounced off the boards and slammed onto the ice isn’t exactly easy on the body, the Avalanche’s strength and conditioning coach, Casey Bond, labels skating a great exercise for any age. Skating is a low-impact, easy-on-the-joints exercise, but it has all the cardiovascular benefits of a higher-impact workout, Bond says. It also helps hone balance, flexibility, quickness and agility. Bond’s tips for newbies: Warm up before getting on the ice. Work up a light sweat, so that the joints and muscles are loose and warm, to avoid injury. Before and afterward, stretch, paying special attention to the hip flexors, groin, lower back and gluteals, he says.